To help you select the best evidence-based practice to use with your student, it is important to identify the target behavior. The target behavior must be observable and clearly defined in the setting where it occurs. All team members should be able to identify the behavior (including its frequency and duration) based on the clarity of the definition of the behavior. The table below outlines behaviors that are observable and those that are difficult to define. When the behavior has been clearly defined and is observable, members of the team will need to collect data to determine how often (frequency) and for how long (duration) the behavior occurs before beginning an intervention. This is called baseline data collection and is important for establishing a measurable IEP goal or IFSP outcome. Baseline data should be collected a minimum of four days or until a trend is clear and stable thus giving you information upon which to base your goal performance expectations. 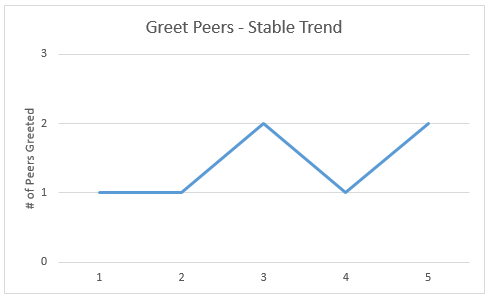 When direct observation of behavior is used, data can be graphed in order to show when the baseline trend is stable. The data collected represent an unstable trend with highly variable data points. Additional data points are needed to determine a stable trend. 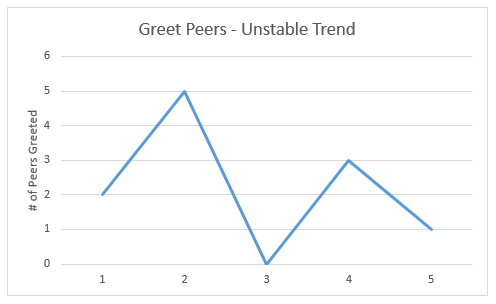 The data collected represent a stable trend with only slight variations between data collection points. The intervention can begin. Baseline data will also help you determine if the chosen evidence-based practice produced a change in the learner’s behavior or use of a skill. Use the Data Collection Form to help you collect baseline data on the duration of a behavior. Use the Data Collection Form to help you collect baseline data on the frequency of a behavior. The team will then need to review the original IEP or IFSP goal or outcome. Sometimes, these outcomes are not written in clear, measurable terms. If the goal or outcome was stated in broad terms, it will need smaller and more defined “steps” or objectives. These smaller steps or objectives will help the team monitor progress toward achieving the broader outcome. how the team will know when the skill is mastered (how? or the criterion). Max will increase his social skills with peers. Max will initiate interactions with peers by saying, “Hi,” on the playground and when joining a small group without prompting from adults in 4/5 opportunities. NPDC has used a defined goal/outcome scaling process that incrementally looks at progress toward goal achievement over time. Learn more about writing measurable goals and the Goal Attainment Scaling process. What are the strengths of the student including learning style, temperament, interests and motivators? What has and has not worked in the past at home and at school? What is particularly challenging for the learner? What is the goal trying to accomplish and in what learning domain? What is the knowledge and skill level of the teacher and other interveners? What EBPs have been used successfully by teachers and team members? What supports are being used effectively with the student? What equipment is needed and available to support implementation of the practice? What people and resources can be identified to assist with implementation (related service providers, siblings in the school, peers)? What additional learning experiences exist at the school or in the community that would be beneficial in achieving the goal (clubs, sports teams, community-based experiences)? Information obtained by considering these four sources will provide clues that can inform your EBP selection. The NPDC Age and Domain matrix can be used to identify those EBPs identified by the research literature for the age of the learner and the domain of instruction. For example, if the goal relates to increasing the reading skills of a high school student, the team can consider EBPs that have been shown to be effective with this age range for the outcome of Academics. By looking at the chart, the following EBPs have addressed Academic outcomes for 15-22 year olds: ABI, PMII, PP, and TAII. Use the Domain Matrix (PDF document, 1 page, rev. October 2018) to help you identify EBPs identified by research for the age of the learner and the domain of instruction. 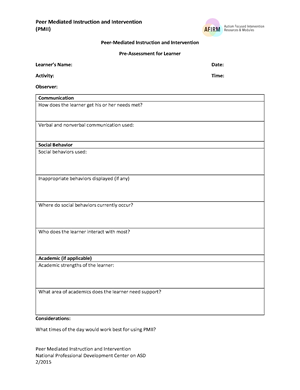 Use From IEP to EBP Planning Worksheet as a planning checklist for selecting an EBP to be used with a learner with ASD. Once an EBP or several EBPs have been selected as probable interventions, the team needs to identify who will implement the practice(s) with the learner. One might start by deciding where the behavior or skill is most often demonstrated or needed and target the teachers in that environment. With time and success in the use of the intervention, others with whom the student engages could be trained to use the intervention effectively so that consistency across settings is maximized. To increase the likelihood of success, it is critical to follow the four-step process outlined above to select an EBP. Once an EBP is selected, the materials in the AFIRM modules are designed to assist teachers, interventionists, and providers learn about specific evidence-based practices and how to use them with fidelity to address learner goals and outcomes. Find out more about AFIRM modules. Let's look at two case studies of how information helps you choose an effective EBP. Get started - it's free and easy! Autism Focused Intervention Resources & Modules (AFIRM) is an extension of the National Professional Development Center (NPDC) on ASD. Visit the NPDC website for more information.